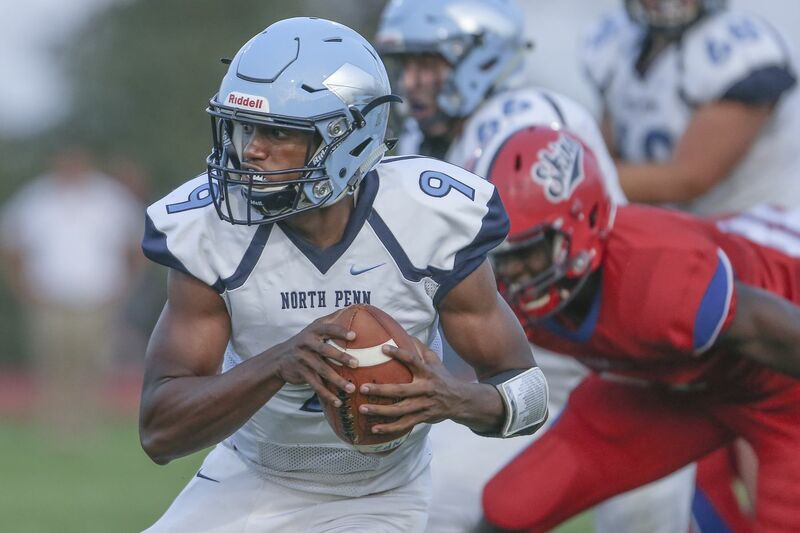 North Penn's quarterback Solomon Robinson during last week's season opener. Rain for much of the region called for some good old fashioned ground and pound football. All three of North Penn's touchdown came on the ground as Solomon Robinson's key third-quarter 60-yard touchdown run Friday lifted the Knights over La Salle, 21-13. Robinson's run gave the Knights an eight-point lead with less than seven minutes remaining in the third. Julian White rushed for two touchdowns, including a 14-yard score in the fourth quarter to ice game the game for the Knights. North Penn’s Julian White scored two touchdowns in a victory over La Salle. Jahmair Rider's 10-yard touchdown reception in the second overtime from Sean Mullarkey gave Radnor a 27-24 victory over Marple Newtown. Matt Cohen punched in a 3-yard run to give the Raiders a lead in the first overtime. Colin Ferry caught a touchdown a 4th and 15 to knot the score again after the first extra session for the Tigers, who had a three-point lead in the second overtime after Jimmy O'Brien's 22-yard field goal. Jalen Smith's second rushing touchdown from five yards out with 39 seconds left gave Bensalem a 22-19 triumph over William Tennent. Jared O'Connell had a 36-yard touchdown run in the fourth quarter for the Owls. Brad Bryan's 1-yard keeper and 17-yard touchdown pass to Michael Terra in the second half pushed Quakertown past Souderton, 28-14. Terra also had a 14-yard run early in the fourth quarter. The Panthers scored 21 unanswered points after halftime. Drew Gunther threw two touchdown passes of 50-yards to Ryan Maguire and Ryan Iacone in Malvern Prep's 49-14 win over Roman Catholic. Keith Maguire added a 25-yard interception return for a score for the Friars. Malvern Prep quarterback Drew Gunther threw two long touchdown passes in the Friars’ victory over Roman Catholic. Jahlil Sanders went 10-for-15 for 131 yards and three touchdowns as Archbishop Ryan took down Frankford, 41-0. Tyreek Chappell caught four passes for 83 yards and two touchdowns, including a 41-yard score in the third quarter. Julian Jones tallied 100 total yards and a touchdown for the Red Raiders. Brody McAndrew rushed for two scores and threw for another to lead Neshaminy over Pennridge, 27-14. Zaire Savage rushed 38 times for 178 yards and a touchdown as Upper Merion blanked Norristown, 10-0. Strath Haven stormed back from 12 points in the first half down behind Zack Hussein's two rushing touchdowns to knock off Lower Merion, 22-18. Jake Fisher added a 2-yard plunge and recorded an intercept on the game's final play to seal the win for the Panthers. Jon Kane rushed for three touchdowns and threw for two more to lift Council Rock North over Wissahickon, 34-0. Julz Kelly totaled 118 yards on 18 carries and three touchdowns to lead Sun Valley past Upper Moreland, 35-0. Kelly has accumulated nine touchdowns in the first two weeks of the season. Nair Polk ran in scores of 11 and 5-yards as Roxborough rolled to a 38-0 victory over Strawberry Mansion. Lamar Wilkes contributed a 55-yard interception return for the Indians. Max Perry accounted for 276 total yards and two touchdowns each passing and rushing in Springfield (M)'s 43-0 win over Lower Moreland. Carter Stepney rushed 11 times for 85 yards and a touchdown and also hauled in his only pass for a 43-yard touchdown. Wilson Krewson caught two touchdowns passes for the Spartans. Mike Slivka threw for two touchdowns and ran for another as Upper Dublin defeated Central, 32-12. John Kohlbrenner added a rushing score for the Cardinals. Charles Ingram tallied 115 total yards and four touchdowns all in the first half to lead Bonner-Prendergast over KIPP DuBios, 49-0. Cole Palis recorded two passing and two rushing first-half touchdowns as Garnet Valley beat Ridley, 55-21. Colin Robinson added two rushing touchdowns for the Jaguars. Jack Ruane connected with Kevin DePrince on all three touchdown passes as Haverford High rolled past Conestoga, 44-15. Ruane also had touchdown runs of 28- and 10-yards for the Fords.